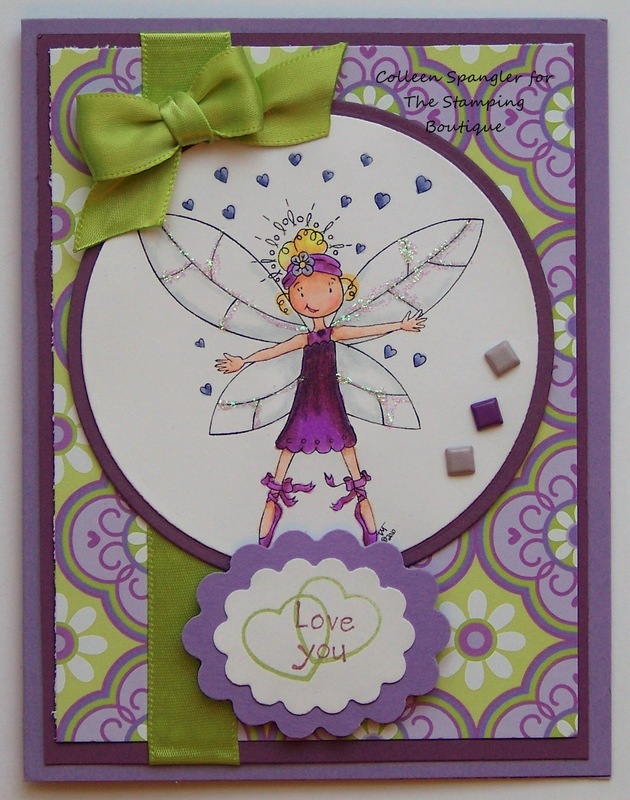 The Savvy Stamper: The Stamping Boutique Digi Day! Today was digi day over at the Stamping Boutique. There were some great challenges! I was able to do 2 of the 3 challenges. This first card was for the challenges to doodle hearts somewhere on your project. This was hard for me as I am not a doodler! But that's ok because it is something different and I kind of like how it turned out! 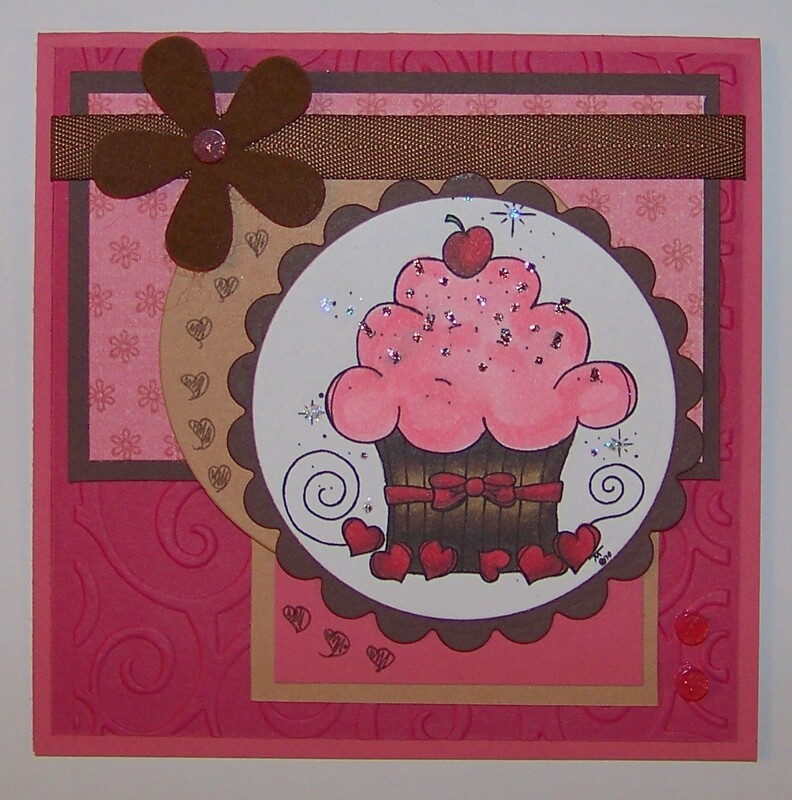 The adorable cupcake is from The Stamping Boutique - I can see this being a great image for many occasions! I used the fabulous sketch from Sweet Sketch Wednesday. I am also entering this in the Papertake Weekly Challenge - anything goes + flowers. This second card is for the challenge to make a Valentine's card but using NO red or pink. I found this DP in my stash and thought it fit perfectly! There are even little purple hearts in the DP. It makes me happy. This is image is "I love you this much Cynthia." So cute! I just posted my card and look who is next to me, YOU! I think your doodles look great. what a fun card. Good to see you over here at SSW, it is one of my favorite places to get a sketch. Hi Collen. I sure love your cupcake. Your colors are wonderful and I love that embossing foler you have used. Nice to have you join us this week. awesome card and take on the sketch this week ~ i'm lovin that colored cupcake ~ yummy! oh loving that card this week. The cupcake looks just so yummy. Love the colors you used. Arlana@SSW!!! Both cards are so sweet! I love that Stamping Boutique cupcake and Cynthia. Thanks so much for joining us at SSW! Well this is a yummy cupcake! Love your card and all its detail - especially those doodled hearts! Great textures too. Thanks Colleen, for joining us this week at Sweet Sketch Wednesday! Hi Colleen love both of your cards, that cupcake looks good enough to eat. Great papers I love your doodles, I thought it was on the DP to start with. Love your purple and green card to of my favourite colours together. Great cards. Thanks so much for sharing your cards at Sweet Sketch Wednesday and good luck. Ahhhhh, would you look at these two adorable cards!!! I love 'em!! Such wonderful images for both! Thanks for joining us at Sweet Sketch Wednesday. Oh your cupcake is just delis!!! Both card are wonderful! Thanks for joining us at Sweet Sketch Wednesday. Two beautiful cards Colleen! The cupcake is adorable looks good enough to eat ;) Thanks so much for joining us this week @ SSW. What cute cards and a beautiful job with this week's sketch! These are adorable Colleen! Love the paper on the purple card and your colouring on the cupcake looks good enough to eat! Love both of them, Colleen - Great Job! Oh Colleen both of these cards are wonderful! I love that sketch and the colors on 2nd one are FANTASTIC! Ooh...I love 'em both Colleen! Those cupcakes are the yummiest and I love the fairy with the green and purple - they look awesome! Both of them are great.. you always use great colour combinations.. that green and purple is so great together!